God bless you and all who come here. He has blessed me with my life and some testimony. I will pray for you and Maxine. You are NEVER late but always on time and your dear ones are on my prayer list. It's good news to hear they are recovering and healing; yes, it's true, sometimes it takes a near brush with death to remind us life is short and love is dear. It's especially awful when the rift is between Christians; it hurts our witness, it hurts Jesus, it hurts us. I'm praying God will use this bad for all your good and for His glory. Hugs, prayers and love to you. You have found gems, dear Sandra, and you give them to us readers! What a wonderful theme. 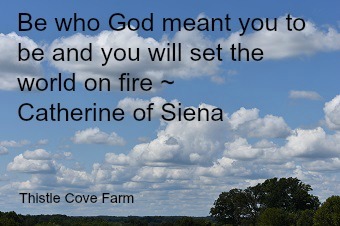 I really love the sentence of Katharina von Siena. our aim is to be through HIS grace the person, HE wants and created us to be. Without His grace and help and choice we can do nothing. Praying for you and Maxine. Thank you so much; I don't know what's going on in Max's brain but I pray God is protecting her from the awfulness of the brain cancer. I say this every week…spot on. Thank you! You're welcome Anita and thank you for reading and commenting. Thanks Karen; it must be working. Today was a trial followed by a trial followed by a trial, etc. The only good thing about today is the LORD made it and it's almost over . I liked that as well! I was asked to share my tithing testimony in our worship service a few weeks ago. Tithing and giving to support my church and missions has never been an issue for me – it was something we just did. I am so thankful for my strong upbringing so that it is still not an issue. Thanks for sharing these reminders of what God requires. Same with me; I grew up with parents who read their Bible's daily, prayed, tithed, supported missions & church…still do. I am the way I am because I was taught and I watched and followed. Yes, Dewena, I'm always preaching to the choir and happy when others find it useful. Lewis, MacDonald, Ravenhill, Chambers, Spurgeon and others are my go-to for deep. They make me think and in doing so, increase my faith. You're right…each Sabbath Keeping post is gleaned from the week's events. The Natalie Angier quote is physical proof of what we already guess instinctively. I always zero in on your C. S. Lewis quotes. As usual this one seems to be Scripture with shoes on. And I always wonder when I read your Sabbath Keeping posts, Sandra, about what you must have experienced during the week that brought the theme to your mind.